Canmore’s Rocky Mountain Outlook of 29th July 2015 has published an article profiling CH’s current work on the Athabasca Glacier in Jasper National Park. 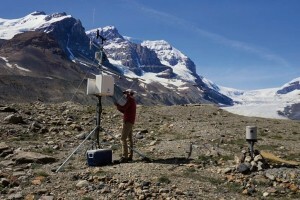 The research, conducted within the framework of the Canadian Rockies Hydrological Observatory (CRHO), aims to obtain observations of atmospheric conditions close to the ice surface, which may in turn be related to rates of melting and retreat by the glacier. This will also permit comparisons to be made with conditions affecting other glaciers in the area, such as the already greatly reduced Peyto Glacier in Banff National Park, further to the south. The article is available from the RMO site, here. The University of Saskatchewan is seeking an exceptional individual for a three-year appointment as a Postdoctoral Fellow in Water Quality Modelling. The PDF will contribute to an experimental and modelling programme focused an agricultural land management in the Canadian Prairies, and develop multi-scale models of water quality suitable for agricultural cold regions where snowmelt and frozen ground as well as agricultural practices such as tillage and wetland drainage impact hydrochemistry. The research will provide improved tools to evaluate beneficial management practices and support regional water quality modelling. The position is jointly supported by the Canada Excellence Research Chair in Water Security and the Natural Sciences and Engineering Research Council’s (NSERC) CREATE postgraduate training programme in water security and will be part of the research team of Professor John Pomeroy and Professor Howard Wheater. Qualifications: A recent PhD in hydrology or water quality with experience in hydrological water quality modelling and ability to develop model code in C++ or related languages. Experience in cold regions water quality and/or hydrology is an asset. Interested applicants are encouraged to contact Kate Wilson, Executive Assistant, Global Institute for Water Security by 4 September 2015, with a copy of their CV, a cover letter and the name and contact information for three references. Review of applications will continue until a suitable candidate is identified. The Postdoctoral Fellow will hold their academic appointment with the Department of Geography and Planning and will be a member of the Global Institute for Water Security and the Centre for Hydrology research units.